Glitter Bay 102 is a laidback and stylish holiday apartment in Barbados' dazzling parish of St James. The relaxed unit benefits from a lovely Caribbean style with vibrant wall art and brightly coloured furnishings. Guests will be delighted by the homes spacious and inviting design which sees an open plan living area opens out onto a balcony where you can enjoy absorbing the sun. From the balcony, you'll really enjoy seeing the garden in all of its beauty. The garden boasts bright pink flowering hedges, imposing palm trees and a neat and well-kept lawn. The balcony comes equipped with a dining table where you can eat al fresco. This area is also furnished with a bright green comfy l shaped sofa and additional chairs – enough room for everyone plus guests! The balcony is the homes prime relaxing spot where you can unwind as the sea waves gently crash in the slow winds. Inside, Glitter Bay benefits from a charming and homely ambience, making it a stellar home away from home on the Caribbean island. The bedrooms are simply decorated and are brightened by natural light coming in from the windows for a peaceful night's sleep. The balcony can also be accessed from the master bedroom. What a better way to start your day than with a fresh cup of coffee, devoured whilst looking out onto the gardens and pool? 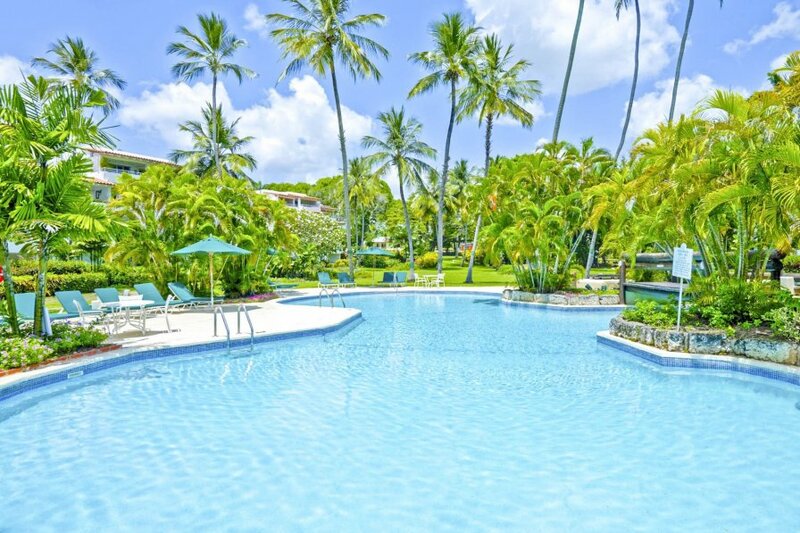 Glitter Bay Apartment 102 is a 2-bedroom condominium, within the Glitter Bay Complex. You and your guests have everything you need to enjoy a beachside holiday. Glitter Bay is situated in the parish of Saint James, an area on the island's west coast that is commonly frequently by celebrities. Famed for being a haven to escape to for tropical sunshine and breath-taking views, St James is the go-to destination for the world's rich and famous. Just a short drive away, you will discover Sandy Lane beach. With turquoise blue waters and soft golden sand, you can easily spend hours at this beach drifting away in the wonderful hot climate. The beach is also great for a spot of water sports. The clear waters make it an ideal location for sighting marine life while snorkelling or experiencing the thrill of riding a jet ski. For a day out exploring this captivating island, try Folkestone Marine Park & Visitor Centre, which lies only a 10-minute drive away from Glitter Bay. The marine park features an attractive beach with a quaint little bar and plenty of sun loungers to rent. Here, you can grab an ice-cold drink and take in the glorious surrounding nature. The park also contains an alluring artificial reef which was created by the sinking of the ship Stavronikita. Visitors to the site will be able to dive the Stavronikita, though, only if they are experienced divers due to the depth of the reef. The site also contains a museum which features an aquarium with many different exotic fish species and a photographic exhibition displaying the island's remarkable marine life.